Prices for beef, poultry and dairy are forecast to rise as corn prices spike amid one of the worst droughts in decades. NEW YORK (CNNMoney) -- Consumers can expect to pay more for beef, poultry and milk, as the worst drought in 50 years spreads across the Midwest, destroying crops and sending corn and soybean prices spiking. The U.S. Department of Agriculture said Wednesday that meat prices would rise significantly, with the consumer price index for beef and veal expected to gain between 3.5% and 4.5% this year. Scorching heat has caused crops to wilt, sending feed prices higher and prompting many ranchers to reduce their herds. "Feed prices are definitely going up," said USDA economist Richard Volpe. "When we see feed costs increase for ranchers, we see them cull their herds." Cattle sales are up nearly 30% over last year, according to Sageworks data. Volpe said the herd reduction could also result in a temporary pullback in beef price forecasts. "But it's still a significant increase over last year," he said. 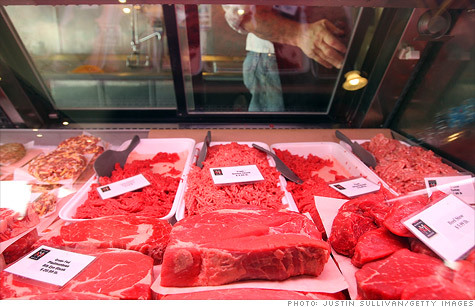 The USDA's prior forecast called for beef and veal prices to jump 4% to 5%. Meanwhile, corn prices for December delivery, the most active contract, rose as high as $7.96 a bushel Wednesday. That's still just about a nickel shy of the record high set in June 2010. The front month September contract continued to trade above $8 a bushel. Still, prices are up nearly 50% over the past three months. And soybean prices have also been on the rise, gaining 25% since early June. "The drought is only going to worsen, and corn and soybean prices always move together," said Volpe. "It's a one-two punch in food price inflation." Last week, Secretary of Agriculture Tom Vilsack said 78% of this year's corn crop was in drought-impacted areas, and 77% of the soybean crop was being threatened. Poultry prices will be the first to feel the effects of the drought. "We expect to see a direct impact this year on poultry," said USDA Volpe. "The animals are smaller and grow faster." The USDA is forecasting a 3.5% to 4.5% jump in chicken and turkey prices this year. And expect to pay more for cheese and milk, with dairy prices headed for a 2% to 3% increase. Eggs will also be impacted, though prices are only forecast to rise 1% to 2% this year. Consumers can expect to pay more for cooking oil and vegetable oil this year, since soybeans are the main ingredient. The USDA is forecasting a rise of 4% to 5% for fats and oils. The USDA has declared 1,369 counties across 31 states as disaster areas this year.